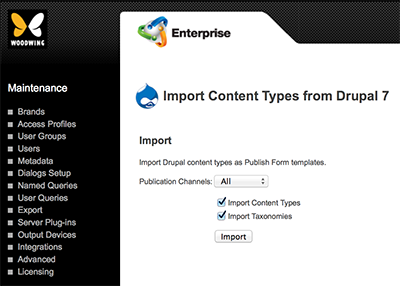 Content types created in Drupal 7 or 8 can be imported into Enterprise where they are used as Publish Form templates. Importing Drupal content types is done through the Drupal Maintenance page in Enterprise Server and needs to be done when new content types are created or when changes are made to existing ones. Step 1. Access the Drupal Maintenance page in Enterprise Server. Troubleshooting: why does Drupal 7 or Drupal 8 not appear on the Integrations page? The Drupal icon is only available on the Integrations page when the Server plug-in "Drupal 7 - Publish Forms" or "Drupal 8 - Publish Forms" is enabled. For more information, see Integrating Drupal 7 in Enterprise Server or Integrating Drupal 8 in Enterprise Server 9. Step 1b. Click Drupal 7 or Drupal 8. The "Import Content Types from Drupal " Maintenance page appears. Step 2. (Optional and only available in Enterprise Server 9.3 or higher) From the Publication Channels list, choose the channel from which you want to import. Step 3. Make sure that the check box for importing content types is selected (only available in Enterprise Server 9.3 or higher). The content types are imported and the result of the import action is displayed.